I’m an Indiana boy at heart and that means Studebaker has always been near the top of my favorite U.S. car makes list. The South Bend, Ind.-based company ceased production in the mid-1960s, but many of its cars were styling successes. 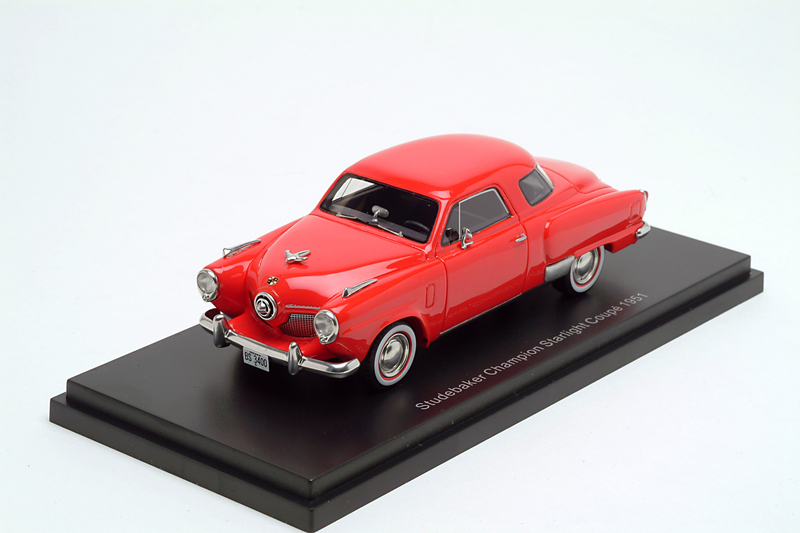 Certainly in 1951 when this 1951 Studebaker Champion Starlight Coupe was roaring up and down U.S. 31 the car’s bullet nose and wraparound rear window were standout features that quickly identified it as a Studebaker. It certainly got folks attention, although some joked that you couldn’t tell if the car was coming or going. 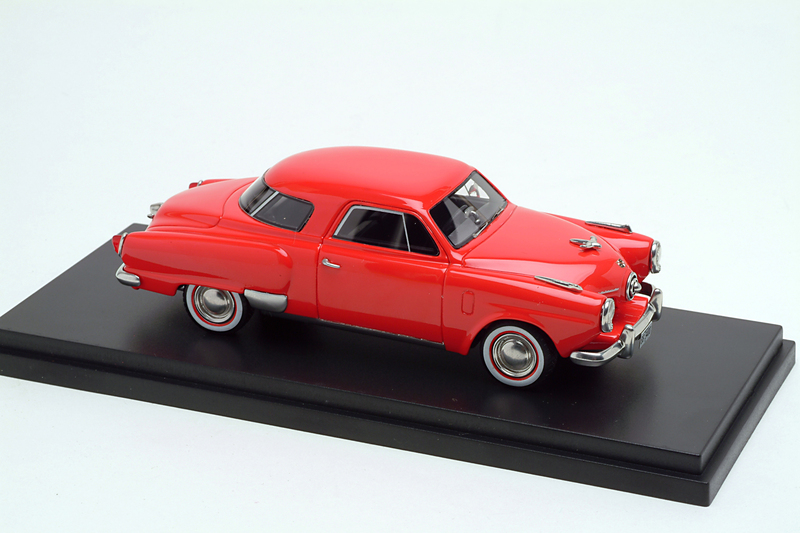 Here Best of Show-Models (BoS) produces a fine 1/43 scale version at a high-value price, making it an easy addition to your collection of 1950s cars and trucks. Studebaker, which had been making wagons and carriages for a century already in 1951,quickly took to the lean aircraft styling that was gaining popularity after World War II. The result was the sleek rounded fenders of the Champion with similarly pointed nose and tail styling, plus a wraparound rear window that gave it an airy, bright interior. It also gave the driver excellent rear visibility. 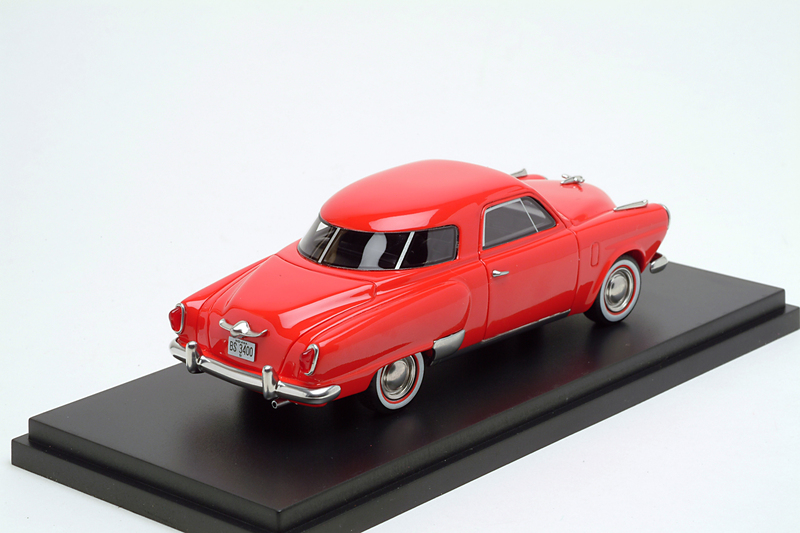 The car was designed by famed industrial designer Raymond Loewy and was recognized for its futuristic look aided by its rounded rear roof and the panoramic rear window. That distinctive look was enhanced in 1951 by the bullet nose, also called a spinner nose. This basic style ran from 1947-52 before the Starlight in its various forms was restyled. Remember when cars changed a little each year? For stats lovers, the car featured a choice of either a 169.9 CID 6-cylinder engine, or new dual-barrel carb V8 that created more than 100 horsepower. Both had a three-speed manual transmission. 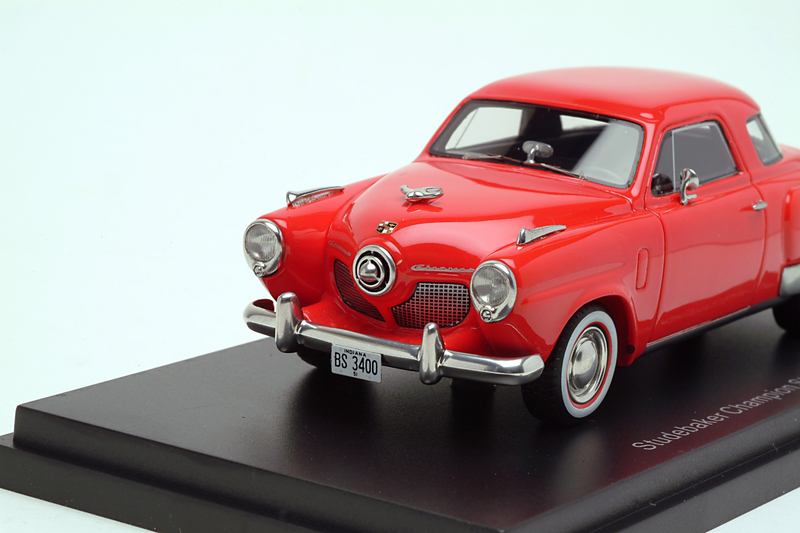 The car rode on a 119-inch wheelbase and Studebaker sold a record 343,164 cars in 1950. So at the time of this model it was at the top of its game. 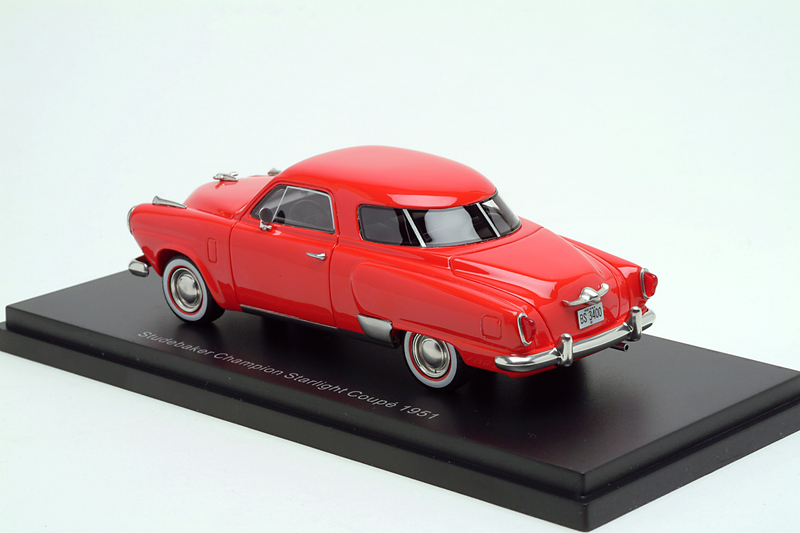 Bright red and with Studebaker’s iconic bullet nose from the early 1950s, the Champion Starlight Coupe is an assault on the eyes – but I a good way. The BoS model has seams cast into the body for hood, trunk and doors, plus gas filler door and air vents in front of the doors. You’d expect no more at the car’s sub-$40 price point. But you might not expect this much detail, starting with the chrome-ringed headlights with clear textured lenses, photo-etched metal grille that is flush with the body, as in the original 1951, and nicely detailed chrome nose piece. Bumpers front and rear are chrome too as is the splash guard just in front of the rear wheels, airplane-like hood ornament and trim atop the front fenders. I was impressed by chrome trim around the side windows and fine black edging on front and rear windows, plus three chrome strips on the wrap-around rear window. There’s a chrome mirror, hub caps and wheels and a trunk emblem that looks like a metallic bird in flight. The Stude also has sharp-looking red taillights with chrome trim and an Indiana license plate, front and rear. Tires include a broad white-sidewall and a red ring inside of that just next to the chrome wheels. Inside is a gray and black interior with big three-spoke steering wheel and dash gauges that you can nearly read. Oh, and there’s a rearview mirror on the dash, a standard location at the time. 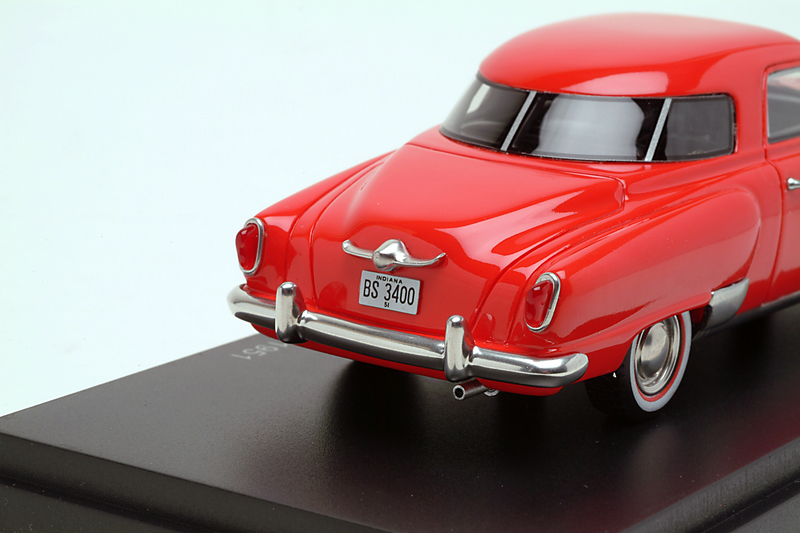 All told a well-executed 1/43 model with a beautiful glossy red paint job and enough detail to impress at this price point. This and the Corvette Corvair Concept I reviewed earlier this year tell me BoS-Models are well made and reasonably priced.